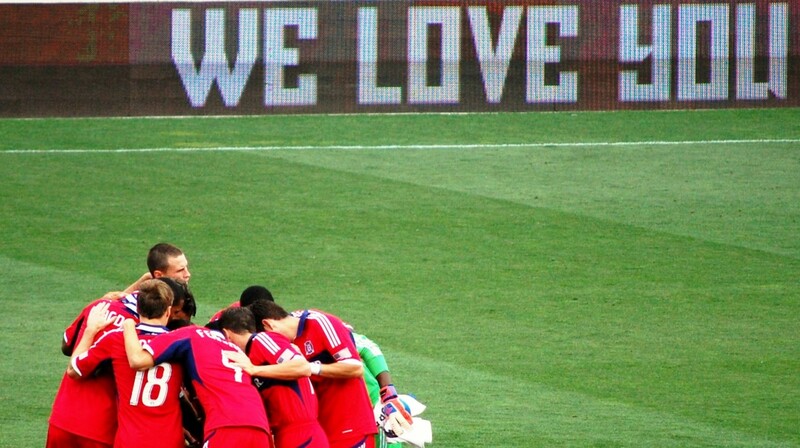 The Chicago Fire defeated the NASL’s Ft Lauderdale Strikers 3:0 on Wednesday to advance to the semifinals of the US Open Cup. It is the Fire’s 12th appearance in the semifinals, tops for a professional club. One look at coach Veljko Paunovic’s lineup sheet for Saturday’s match in Dallas made it clear that the Chicago Fire are putting all of their available resources into Wednesday’s US Open Cup match versus the Ft Lauderdale Strikers. Sean Johnson, Jonathan Campbell and David Accam were left at home, and Brandon Vincent, Khaly Thiam and Razvan Cocis started the game on the bench. The patchwork 11 that started the match was designed to hold things together and count on Lady Luck to nick a goal somewhere. Given the quality of the opponent, it wasn’t that good of a plan on paper and it worked out even worse on the field, as FC Dallas handed the Fire a 3:1 pasting to send the Fire back into the Eastern Conference cellar. The difference between good teams and bad ones quite often can be found in the quality of their second-line players. Dallas brought in Victor Ulloa, Mauro Rosales and Tesho Akindele as substitutes on Saturday. It would be easy to argue that all three would be starters if they played for Chicago. Fire fans were treated to a starting lineup that contained Matt Lampson, Michael Harrington, Nick LaBrocca, and Michael Stephens. How many of those players would even see the field if they played for Dallas? When you’re at rock bottom, the climb to the top can seem unreachable. On Wednesday, the Chicago Fire took the first steps on that climb, on the heels of a 1:0 home victory over Sporting Kansas City. Newcomer Michael de Leeuw had a productive home debut, banging home the game-winner, and goalkeeper Sean Johnson went above and beyond the call of duty with two fantastic saves to preserve the win. The Fire have a long way to go before they reach the top, but the 17 points that they have earned from as many matches inches them above the Columbus Crew in the Eastern Conference table and out of last place. Is it ridiculous to talk about the Red Line? The Fire trail sixth-place New England by five points and have played two fewer games. The Fire won’t win any plaudits for playing creative, flowing football off of this performance. They did, however, show signs that they might one day become a good team, once all of the playing pieces are aligned optimally. Faced with a schedule of Saturday-Wednesday-Saturday for two weeks, coach Veljko Paunovic had to do some serious squad rotation versus SKC. When he can get his best attackers on the field to start a match, we might get a clearer idea of his team’s true capabilities. When forming a roster in MLS, there are basically two ways to do it. Go big, and lavish significant money on “name” players, or, become proficient at identifying talent that will excel in MLS, but not break the bank to do it. Teams like Portland and Real Salt Salt have succeeded using the latter approach. Teams like Toronto FC, the Fire’s opponent last Saturday, have gone big. Toronto is still seeking their first trophy, but the quality of their star player, Sebastian Giovinco, is unmistakeable. Although he didn’t score on Saturday, his influence on the match was in evidence for the full 90 minutes, leading TFC to a 1:0 victory. The Fire have now gone a full two years since last winning a road match. Giovinco is the league’s reigning MVP and he showed why, setting up the goal to put TFC ahead for good. He was inches away from swerving a free kick past the Fire defense in the second half and generally caused loads of trouble for the Fire midfield. Giovinco was the best player on the field and a difference-maker in the outcome. The Fire expended a lot of energy trying to contain him and were also unable to offer much on the attacking end as a counterbalance. To put it into perspective, Giovinco earns about $7 million per season. That amount is two to three times bigger than the COMBINED salaries of the Fire’s starting attackers. You really do get what you pay for.